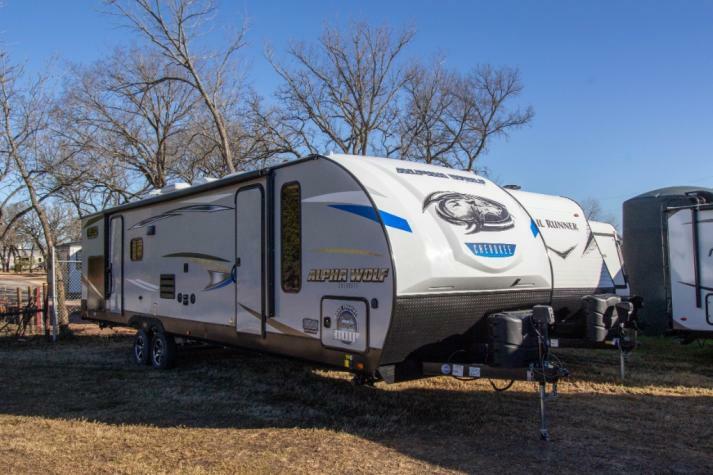 For the ultimate outdoor getaway that your family will talk about for years to come, you need this Cherokee Alpha Wolf travel trailer. With its ability to sleep nine people comfortably each night, this unit is a vital part of any summer vacation, and because this model contains both a private bunkhouse and a master suite, everyone will have their own separate living area. As you play outside in the hot sun and work up a sweat, you will appreciate being able to easily grab an icy cold beverage from the double-door refrigerator in the outdoor kitchen, and the 20' awning will provide shade whenever you need to take a break and cool down. 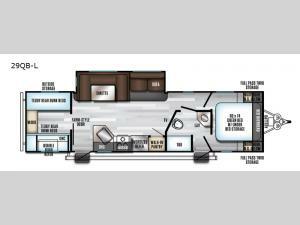 The Cherokee Alpha Wolf travel trailer is the first of Cherokee's line up to be fully laminated, which makes them lightweight, well insulated, and able to provide a sleek and modern exterior. The tire pressure monitoring system and exterior shower with hot and cold water add to the usefulness and value of the Alpha Wolf, and the LED lighting on both the exterior and interior delivers a bright and cheerful atmosphere no matter what time of day it is. Inside of the Alpha Wolf you will find stainless steel appliances in the kitchen and plenty of storage for your pots and pans underneath the sink.